Captain William Bligh – “Bligh of the Bounty” – is one of the best remembered officers of the Age of Fighting Sail, not only because of the loss of his ship through mutiny but for his 3618-mile, 47-day voyage to safety in an open boat, an epic of navigation and leadership. There was however another Bligh – William’s third-cousin – whose memory also deserves to be honoured. 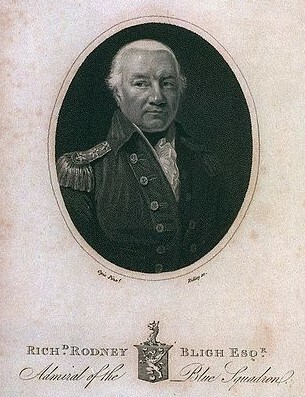 This was Captain (later Admiral) Sir Richard Rodney Bligh (1737 –1821) whose career had begun as early as the Seven Years War, when he had served with the doomed Admiral Byng in the failed attempt to capture Minorca in 1756. He served with distinction during the rest of that war, and in the American War of Independence 1775-82. By the time France declared war on Britain in 1793 – thus starting what would be the two decades of the Revolutionary and Napoleonic Wars – Bligh, now a captain, was in command of HMS Excellent, a “74” ship-of-the-line. He was transferred the following year to command another 74, HMS Alexander, in in her he was to fight one of the most unequal battles of the era. Alexander was typical of the 74s, the class that formed the backbone of Britain’s naval power, and was armed on the broadside with twenty-eight 32-pounder sand an equal number of 18-pounders, while some eighteen 9-pounders were mounted as chaser weapons fore and aft. On 6th November 1794, off Brittany, Bligh in Alexander, together with another 74, HMS Canada, was returning to Britain after escorting an outbound convoy. Around three o’clock in the morning other ships were detected in the vicinity and passed as close to them as was estimated to be half a mile. Unsure of their nationality, but fearing the worse, Alexander and Canada bore up, shook the reefs out of their topsails, and set their studding sails. This caution proved wise for as daylight dawned the other vessels proved to be a very powerful French squadron, consisting of five ships-of-the-line, three frigates and a brig, which now initiated a chase. The best chance of saving Canada, Alexander or both from falling into the enemy’s hands was to split up in the hope that the enemy force would also divide. Crowding all the sail they could carry, the two British each steered a different course. 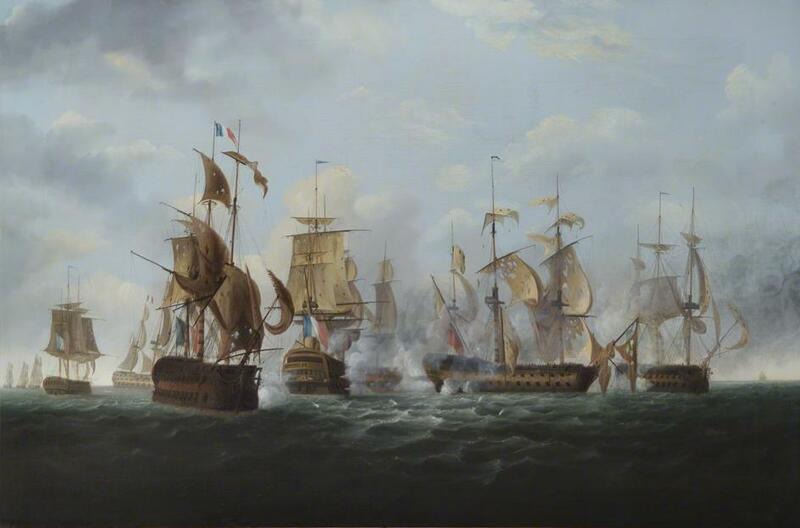 This resulted in two of the French ships-of-the-line and two frigates chasing the Canada, while three ships-of-the-line and two frigates went in pursuit of the Alexander. Despite the punishment Alexander had taken, the casualty list was surprisingly low – some 40 dead and wounded. The explanation may have been that the French, following their usual practice, had concentrated their fire on masts and rigging to prevent escape while doing minimum damage to the hull. The French loss and damage must have been much more severe, as the whole squadron was obliged to quit their cruising ground and to return to Brest for refitting. Bligh – who, unknown to himself, had been promoted to rear-admiral a fortnight before the action – returned to Britain as part of a prisoner exchange six months later. He was required to undergo the inevitable court-martial for the loss of his ship but, equally inevitably, he was acquitted with honour. He remained in active service until 1804, retiring as a full admiral. Heavily damaged though she had been, the Alexander also had an active career ahead. Repaired, she was brought into French service as the Alexadre but was retaken by the Royal Navy in the Battle of Groix a scant seven months after Bligh’s action. 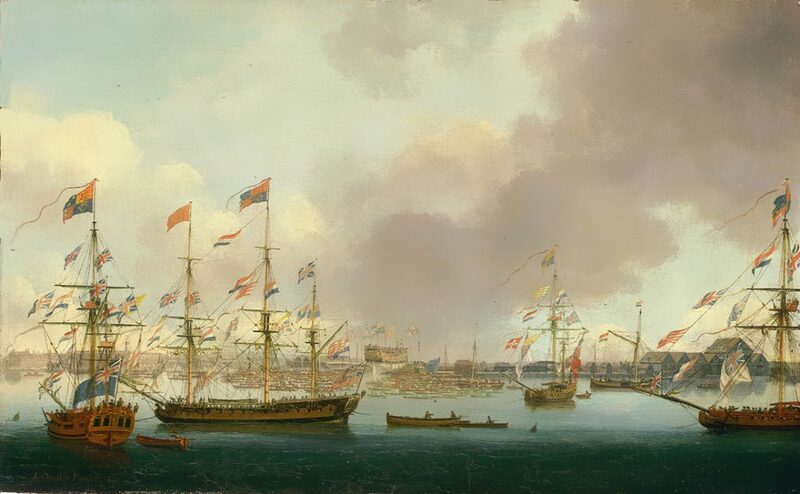 Once more HMS Alexander, she was to have her moment of glory at the Battle of the Nile in 1798, engaging the flagship, L’Orient, as well as other French ships. If you’re a Kindle Unlimited subscriber you can read any of the six Dawlish Chronicles novels without further charge. They are also available for purchase on Kindle or as stylish 9X6 paperbacks.